November 29th, 2016 | News and Events, Wheaton World Wide Moving. 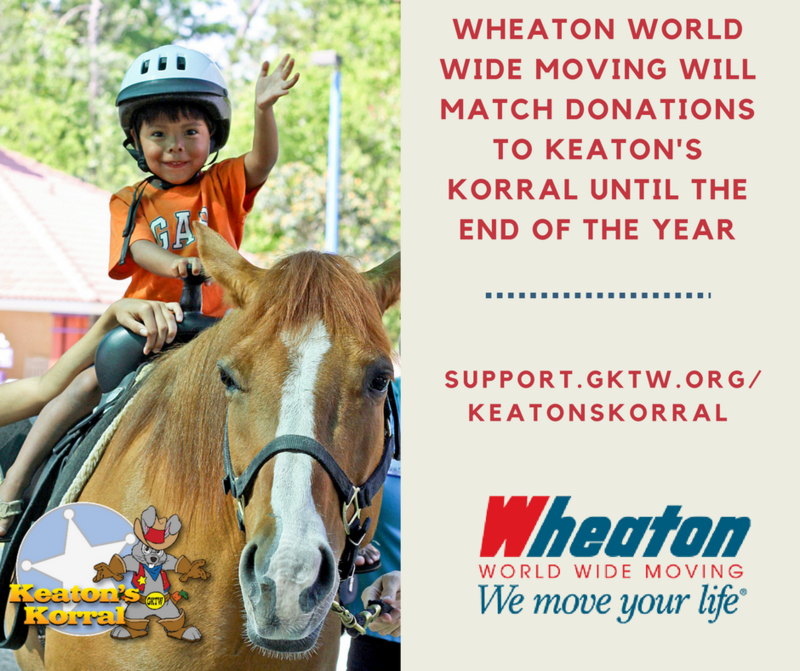 INDIANAPOLIS ─ Wheaton World Wide Moving will match donations up to $30,000 to Keaton’s Korral at Give Kids The World Village starting on Giving Tuesday, November 29 until the end of the year. All donations can be made on the secure fundraising website: http://support.gktw.org/keatonskorral. In addition to matching donations, Wheaton will host a weekly social media giveaway. Starting on Monday, Dec. 5, 2016, for four weeks, the van line will award a prize to a randomly chosen person who has donated during the previous week. For more information, please go to the Wheaton’s Facebook pages and Twitter pages. Wheaton World Wide Moving has been a partner of Give Kids The World since 2000. Through Wheaton support of Keaton’s Korral, more than 7,900 families annually are able to experience the fun of horse and pony rides, as they wear cowboy hats. Keaton’s Korral was named for Keaton White, an alumnus wish child who spoke at a Wheaton conference shortly before he lost his battle with cancer. His story touched so many of the agents and employees as he shared his dream to ensure every child experiences the joy he felt during his time at the Village.